"The custom is in this part of Hertfordshire to leave a border round the ploughed part of the fields to bear grass and make hay from, so that, the grass being now made into hay, every corn field has a close mowed grass walk about 10 feet wide all round it, between the corn and the hedge. This is most beautiful! The hedges are now full of shepherds rose, honeysuckles, and all sorts of wild flowers, so that you are upon a grass walk, with this most beautiful of all flower gardens and shrubberies on your one hand, and with the corn on the other. And thus you go from field to field, the sort of corn, the sort of underwood and timber, the shape and size of the fields, the height of the hedgerows, the height of the trees, all continually varying. Talk of pleasure-grounds indeed!" 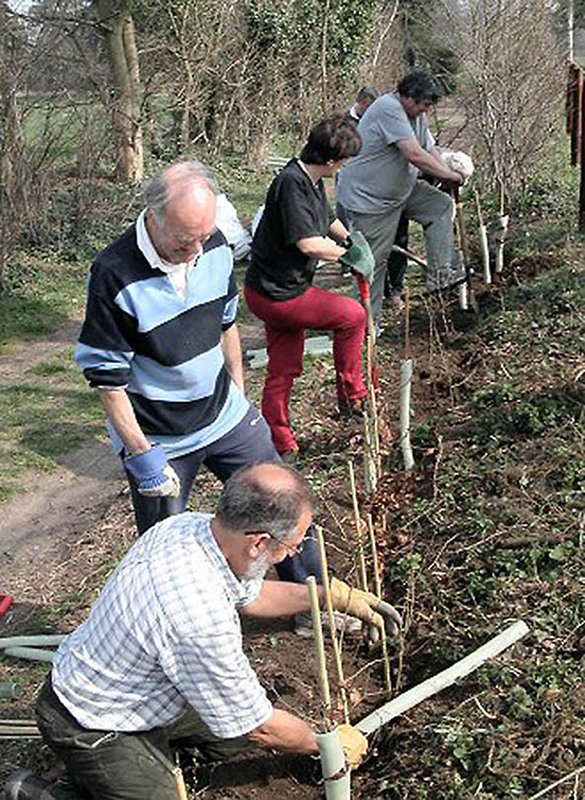 The English Hedgerow Trust was established to make some contribution towards redressing the massive destruction of hedgerows in the British countryside. Hedgerows are a fundamental part of the heritage of the British countryside, defining the nature of the landscape and providing a major shelter and food source for a huge variety of mammals, birds and insects. Hedgerows are effectively a vibrant ecosystem, a huge nature reserve in our small and (over) intensively farmed country. For suitable projects, we can provide contacts, technical expertise, labour, materials, future planning and maintenance and on-the-job training (for example hedgelaying). We are currently involved in a number of projects, either taking place at this time or scheduled for the next planting window, next winter. These in part or whole meet our charity's aims of conservation, community involvement and education. · A school for children with special needs; we will provide technical input and assistance to create a hedgerow of mixed native species of hedgerow plants alongside a road, with standard trees at around 10 metre intervals along the length of the hedgerow. The pupils will take part in the planting operations, and have an opportunity watch part of their heritage grow; once established, the hedgerow will form an outdoor classroom, and should provide interest and satisfaction for many years. · A reclaimed aggregate site, where around 15 acres of new sports fields has been taken over by a local community group; this area will have hedgerows which will act as wildlife corridors between woodlands, and also act to screen the site from industrial machinery still busy in the rest of the gravel pits. Hedges are complex ecosystems, and are essential habitats for a wide range of flora and fauna; 21 out of 28 lowland mammal, 69 out of 91 bird and 23 out of 54 butterfly species breed in hedges. In countryside with little or no woodland they are essential for the survival of many bird species. They provide valuable sheltered routes along which wildlife can move more freely across the country between fragmented woodlands, function as screens against bad weather, provide cover for game, contain and shelter stock and crops, act as windbreaks and help control soil erosion. Although the countryside has never remained static, the scale of changes in recent decades has led to concerns over the rate that hedgerows were disappearing, either by deliberate removal or dereliction. In 1945 there was an estimated 500,000 miles of hedgerows, but post-war changes in agriculture meant hedges were seen as a hindrance to new and mechanised farming methods, and were therefore grubbed up. Until the mid 1980s government grants were available to farmers for the removal of hedges for agricultural 'improvement'. Between 1945 and 1993 around half of the hedges in Britain were destroyed. Grants are now available for the opposite in an enlightened attempt to repair some of the damage. However, a sustained campaign is now required, if the damage done to one of our national treasures is to be redressed. We have access to enthusiasts, many of whom have considerable experience in countryside conservation fields. We combine a blend of experience and practicality, together with a fundamental belief in the correctness of our aims. · Work in partnership with farmers and other landowners, wildlife organisations and rural communities to achieve our goals. 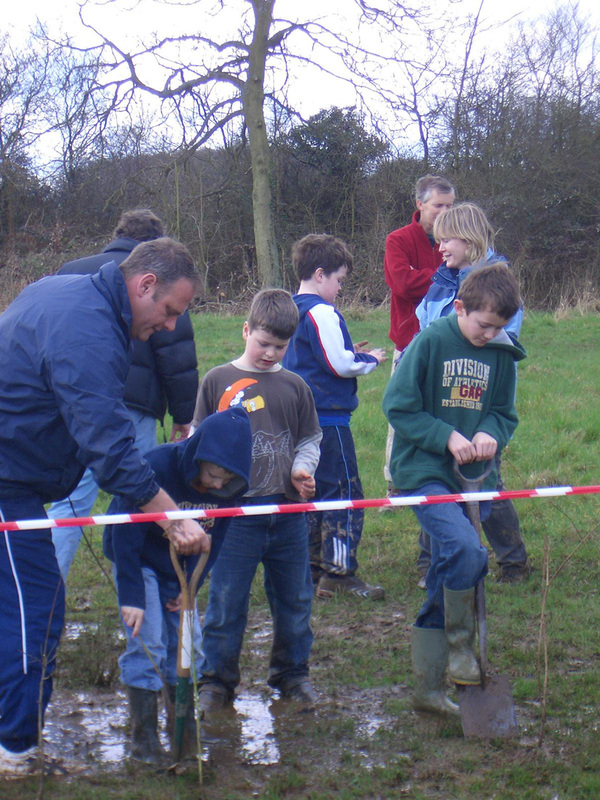 School visits promoting conservation activities in conjunction with the National Curriculum, often in association with Parent/Teacher Associations; these may include 'hands-on' activities such as the creation of hedgerows, tree planting or building wildlife ponds. Schools, small communities and organisations such as parish councils can identify locations where a new hedgerow or grove of trees can raise an awareness in the conservation issues which we seek to emphasise. These groups often have a better perception of local issues than groups and organisations operating on a national basis. We have considerable experience of planting activities, having established several thousand trees and hedging plants in the last few years. Generally, for all their good intentions, 'volunteer planter' efforts are not very efficient. A fit person with a spade can plant a few hundred bare-rooted trees in a day at most; however, a small team working with modified horticultural planting machinery, towed behind a small tractor, can easily plant 5000 small trees or hedging plants in one day. With a double row of hedging plants at 0.33 m intervals, and with trees planted at 15 metre intervals, this means that a team of 3 with the right equipment can plant around 1 km of hedge per day. Financial aid is important; we have a small volunteer staff. We have to pay for vehicles, hired machinery, tree and hedge saplings, fencing, mulching materials.